» All that old gunk, gone! All that old gunk, gone! 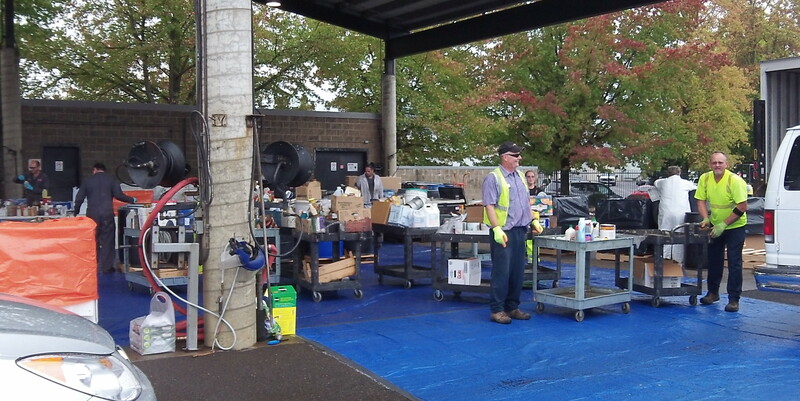 Friday morning at Republic Service’s household hazardous waste collection day. I’m happy to report that a bunch of cans of left-over paint, paint thinner and other questionable liquids are no longer collecting dust or threatening to spring leaks in odd corners of the garage. This morning I joined scores of other people in taking this sort of household waste to the Albany yard of Republic Services, the local branch of the nationwide refuse collection and recycling company. For me and the other residents there just before 10, it took only a few minutes to drop the stuff off and get out of there. On the scene, though, company employees spent from 9 in the morning until after 2 collecting the material from people’s vehicles while others, some in haz-mat suits, were figuring out what they had and sorting it accordingly. I was wondering what they do with all that gunk. While lifting cans and bottles out of my truck, Kevin Hines, one of the company managers, told me that the paint gets recycled and most of the other stuff will end up in some special landfill for hazardous waste. 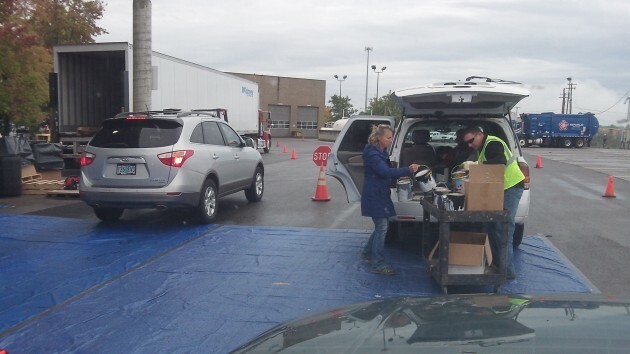 The unloading area has a tarp to guard against spills. I was impressed with the organization that kept things moving. A young woman asks people a few questions when they arrive. What kind of waste? Well, in my case, paint, thinner, some automotive fluids, and chemicals left over from our elder son’s boat-building project. Any electronics? Nope. She directs me into one of two lines, I have time to snap a couple of photos, and five minutes later I am on my way out. Thanks, guys, that was a big help.